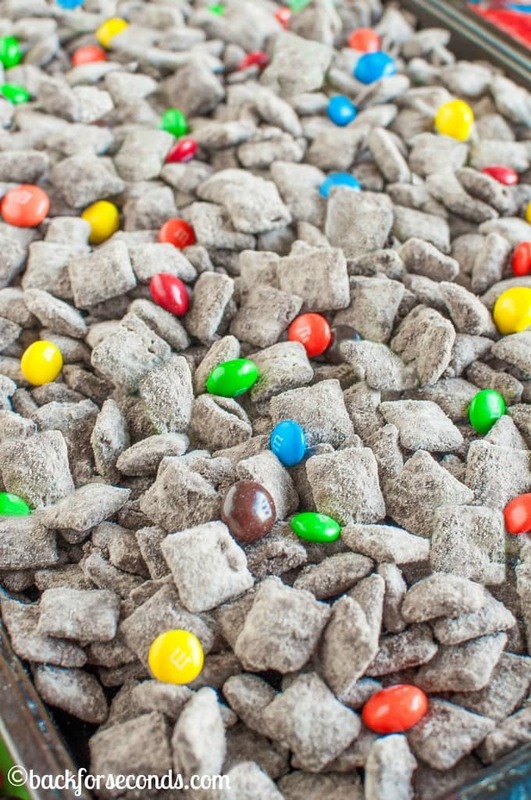 Peanut Butter Brownie M&M’S® Muddy Buddies are the perfect party snack to munch on during the big game or your favorite movie. Quick, easy, and irresistible! Thank you to M&M’s for sponsoring this post! 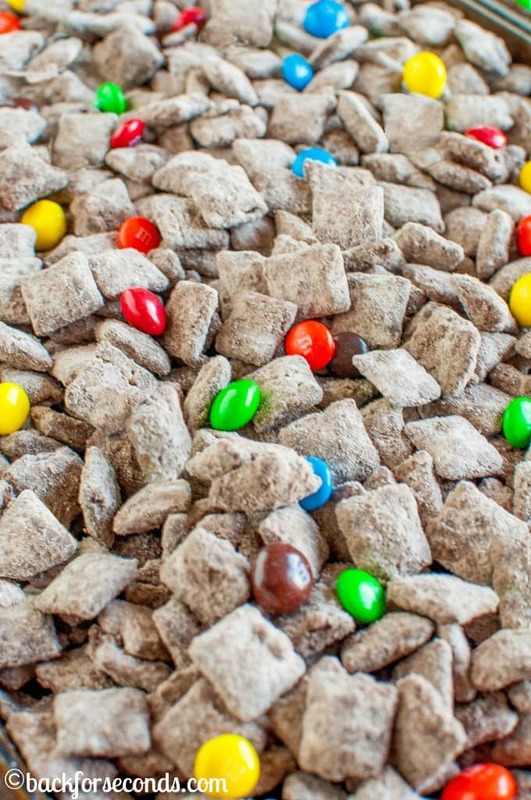 One of my family’s all time favorite snacks is Muddy Buddies. We make them for movie nights (try these S’mores Muddy Buddies), Cupcake Muddy Buddies for birthday parties, and they are the perfect snack to munch on during football games! No matter what’s happening with your team, this snack is always winning! M&M’s are easily one of my favorite candies ever. They are obviously perfect straight out of the bag, but adding them to cookies, cakes, and muddy buddies is such an easy way to instantly make those treats more fun! Think about it. 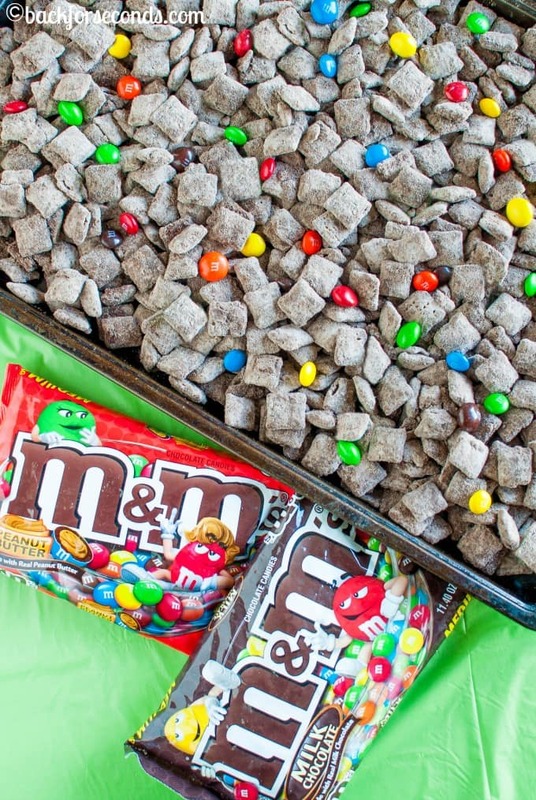 Put a bowl of plain muddy buddies and a bowl of muddy buddies with M&M’s in it, right next to each other. Which one do you think everyone is going to reach for first?? Touchdown for M&M’s! For this particular recipe, I wanted to do something a little different. 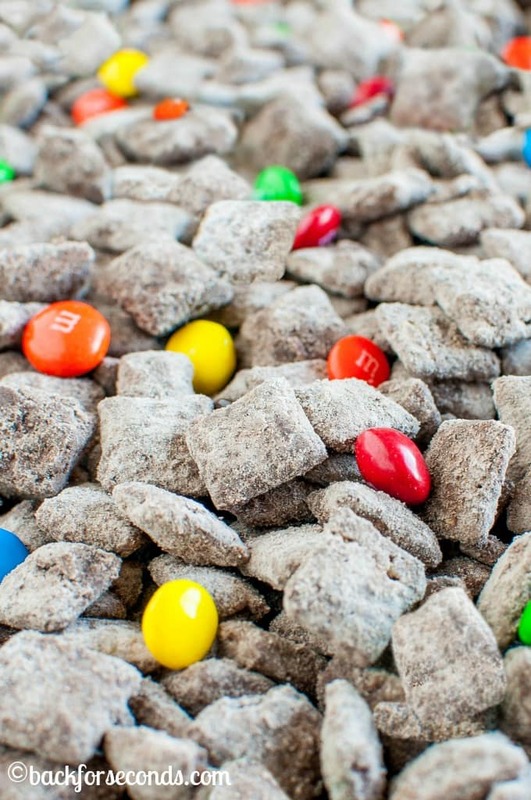 Classic muddy buddies have chocolate and peanut butter and are coated in powdered sugar. Delish. But more chocolate and more peanut butter are always a good idea. So I ran into Target for brownie mix, plain M&M’s and peanut butter M&M’s. (Ok, ok. Mayyyyybe a few other things wound up in my cart as well. I’m only human, after all.) You can get a Cartwheel offer on M&M’s now too! Score! 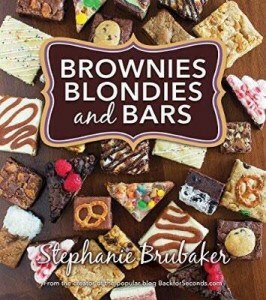 I used a dark chocolate brownie mix to coat these muddy buddies, but you can use any kind you like. You can also use any mix of M&M’s you like best, but the plain and peanut butter are crazy delicious so definitely try them! 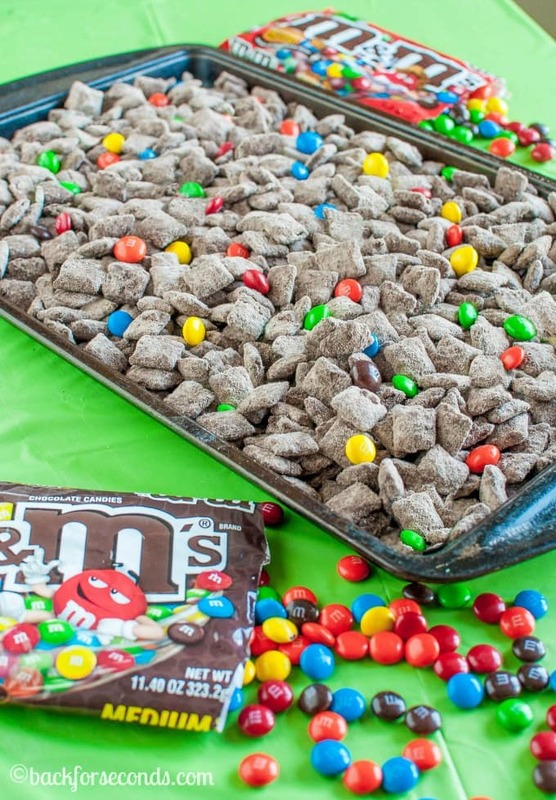 So if you are planning a party for the big game, or if you are attending one – make these Peanut Butter Brownie M&M’s Muddy Buddies! This recipe feeds a crowd and everyone loves them. And if you’re real serious about your team, you could add only the team colored M&M’s to the mix! These will be the hit of the party – enjoy! This would be a great holiday gift in mason jars! 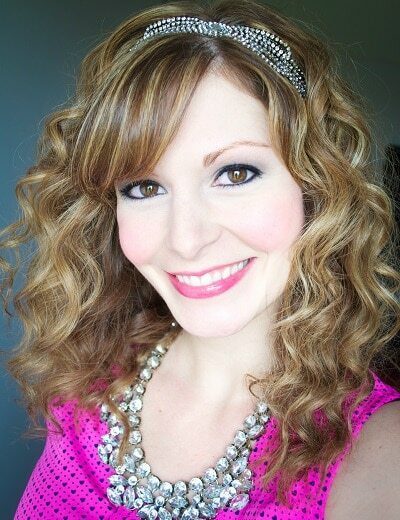 Love love love this! Such a fun holiday snack to have on hand while having family and friends over this season! Mmmm, this looks like some addictive munching food! It so perfect for my children. They would enjoy your recipe a lot! This looks like the perfect snack! This looks awesome!!! Did you use the same cereal flavor for all 12 cups? Chocolate and peanut butter pretty much guarantees that I wouldn’t be able to stop eating these! What a sweet treat for the holidays – love this!